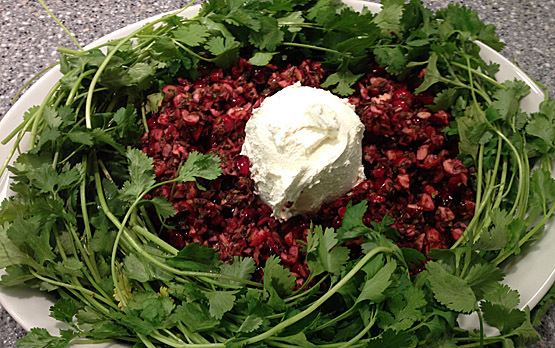 Cranberry Salsa: one of the many healthy recipes freatured in Food for Thought: Healing Foods to Savor, authored by nutritional experts at UC San Diego Moores Cancer Center. What’s round, red, full of holiday cheer, and (dare we say it) good for you? It’s the cranberry. Its powerful goodness, coupled with cruciferous vegetables- such as broccoli, bok choy, and kale- and festive seasonal fruits like persimmons, can change attitudes about “healthy” eating during the holidays. Gain some flavorful food insights in Food for Thought: Healing Foods to Savor, authored by nutritional experts at University of California, San Diego Moores Cancer Center. All proceeds benefit the UCSD Healthy Eating Program (www.healthyeatingucsd.org). Cruciferous vegetables, like arugula, bok choy, broccoli, cabbage, cauliflower, and kale, contain sulfur compounds that support the body’s detoxification system and may help reduce cancer risk. For example, dithiolthiones and isothiocyanates seem to increase the activity of enzymes involved in detoxifying carcinogens. lndoles, another cruciferous compound, appear to alter the metabolism of hormones in ways that might help prevent or reduce the growth of hormone sensitive tumors. Newman suggests surprising your holiday guests with a cruciferous vegetable-rich salad featuring holiday colors made with crunchy bok choy, red peppers, shredded carrots, green onions, and peanuts.